Believe in the Laws of Life. SEED BANKS and LIVING LIBRARIES; a sustainable future for our children. Faith born of first-hand knowledge is indisputable. Faith in Organically Grown (Non-GMO) Mustard Seeds is a sensible, pragmatic proposition. We believe that Life is sacred and that Seed is sacred. The miracle of seed is a wonderful thing: From the humblest of beginnings, such as a tiny acorn, the 1,000 year old oaks and mighty redwood trees are born. All around us we see the evidence of the miraculous wisdom of Godde’s intelligence expressed through the unfolding of DNA. Faith born of first-hand knowledge is indisputable. What we all need, are the innocent eyes of a child, who bears witness to the miracle of Life as a seed pushes up through the soil… that’s more than enough to convince us that an almighty, loving Godde and a Master Architect is at work all around us. In ways and places, too numerous to count, our faith in seed is being fulfilled daily. This kind of FAITH is founded in the first-hand-knowledge of Truth, Beauty, Wisdom and Justice; this is worthy FAITH. Faith in the Law of Life, which is Godde’s true and unwavering Law. Sadly however, some of us have lost our Way and we have strayed from the path of humility and gratitude… some of us have become lost in a thorny thicket of greed and avarice. Some of these people are meddling with Godde’s handiwork and they are tinkering with technology beyond their understanding, and are attempting to alter the Master Plan of Seed through manipulation of DNA and other forms of unnatural genetic modification (creating GMO – Genetically Modified Organisms). We believe that this is a very risky and dangerous activity; some might go so far as to call this an “abomination” and an affront to the Master Architecht. Hence we, along with thousands of other people around the planet, are participating in a global effort to create local SEED BANKS and LIVING LIBRARIES; a Living Library filled with books on sustainability alongside live seeds (non-GMO). These local SEED BANKS and LIVING LIBRARIES will help to insure a sustainable future for our children’s children’s children. Commentary: This is a statement-of-faith from the First Unitarian Universalist Society of San Francisco. It is posted here out of respect for the thoughtful and compassionate spirit that must have inspired its creation. Great teachers of many faiths throughout the ages have stressed the need for ethical social behavior and the worth of the human spirit. These are our spiritual forerunners. Believing that the wonders of the universe outspill every category into which we try to fit them and that the ultimate meaning of our lives can never be permanently reduced to a brief written statement, Unitarian Universalists choose not to organize our church around a creed. We have a set of purposes and principles and a mission statement, but there are no beliefs which serve as a test of membership in our church. The Unitarian Universalist Association (UUA) shall devote its resources to and exercise its corporate powers for religious, educational and humanitarian purposes. 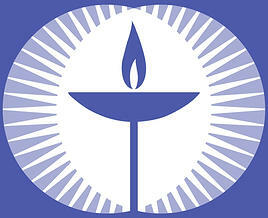 The primary purpose of the Association is to serve the needs of its member congregations, organize new congregations, extend and strengthen Unitarian Universalist institutions and implement its principles.